The grains, which look like small cauliflower, are a symbiotic combination of bacteria and yeast bound together in (ready?) a gel-polysaccharide bio-matrix. In other words, they're somewhat firm, lumpy, gelatinous blobs held together by big sugar molecules (glucose and galactose). I'm not sure how the word 'grain' was chosen rather than, say, 'lump,' but kefir has absolutely nothing to do with cereal grains like wheat or oats. Although still fairly obscure compared to its better-known cousin, yogurt, kefir's popularity is rising steadily. This may have something to do with a growing awareness of its supposed health benefits, which include tumor growth rate reduction, immune system enhancement and the destruction of undesirable bacterial pests in the digestive tract. It's also more digestible than yogurt because its curd size is smaller. The history of its origins is somewhat vague, but most sources agree its birthplace was the Caucasus mountain region in Eurasia. One colorful account holds that kefir grains were a closely guarded secret for centuries until Russian dairy owners, using the charms of a beautiful young employee named Irina, and a stern reprimand from the Czar, wrested some from a tribal prince. However it got here, it's a wonderful, if not unusual way to increase the digestibility and health benefits of raw milk. 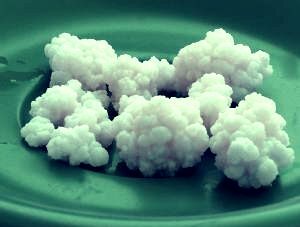 Numerous strains of kefir exist worldwide, differing mainly in the particular species of bacteria and yeasts which reside within. Both lactic acid and acetic acid producing strains not usually found in yogurt (Lactobacillus caucasus, for instance) team up with yeasts like Saccharomyces kefir and Torula kefir to give kefir its beneficial properties. Most kefir purists (and they're out there!) insist that the real thing can only be made from real kefir grains. I imagine many suppliers of powdered starter would disagree, but who's to say? So you want the grains. Where can you find them? Well, unlike the Russian dairymen, you have several more options. Besides doing a websearch, you could go to this site where people from over 40 countries have signed on with their contact info and a willingness to share their grains. Don't forget to come back! Is it easy to make? Sure, but you need to follow some simple rules to make sure you get it right. Check out any of the several great websites (just Google 'kefir') with detailed instructions on how to do it. You'll be surprised at just how much information there is out there on this tart, refreshing traditional food. I know I was.